Stargirl is coming to DC Universe. It was announced by Geoff Johns, who is one of the most impactful writers in the recent history of DC Comics, at San Diego Comic-Con that he's set to bring the character to the small screen. The live-action series is set to debut on the DC Universe streaming service. This is the sixth series announced for the service, joining the likes of the previously announced Titans, Swamp Thing, Metropolis, Doom Patrol and the Harley Quinn animated series. Geoff Johns recently stepped down as chief creative officer at DC Films, but he signed a first-look TV deal with Warner Bros. and this marks his first project under that deal. The series will center on the superhero teen named Courtney Whitmore who will fight alongside the Justice Society of America in the show against an array of different villains from the pages of DC Comics. Johns has an especially meaningful relationship with Stargirl, as he explained as the news was made public during SDCC. Here's what he had to say about it. "Obviously, Stargirl was the first character I created for DC. Most important, Courtney Whitmore was inspired by my sister who passed away. To have an opportunity to tell a story celebrating this superhero was literally the first thing I wanted to do because it is so personal to me. Also, a character that speaks to being young, to a legacy and to pushing forward seems so important to me nowadays." There is no full synopsis available for the Stargirl TV series just yet, but she will be depicted as a high school student. Geoff Johns will executive produce the series alongside Greg Berlanti and Sarah Schechter. Berlanti is no stranger to the world of DC, as he produces all of the Arrowverse shows on The CW and is also involved with the other shows being created for the DC Universe streaming service. Stargirl now gives his Berlanti Productions banner a record-breaking 15 shows. He may well be the most prolific man in the business right now. The character of Stargirl was co-created by Geoff Johns and Lee Moder. She made her first appearance in 1999's Stars and S.T.R.I.P.E. #1. She is a trained gymnast and kickboxer and, via her Cosmic Converter Belt, is given enhanced strength, speed, agility, and stamina. Courtney Whitmore also has a Cosmic Staff that gives her the power of flight and the ability to manipulate energy. She can also project "shooting stars." 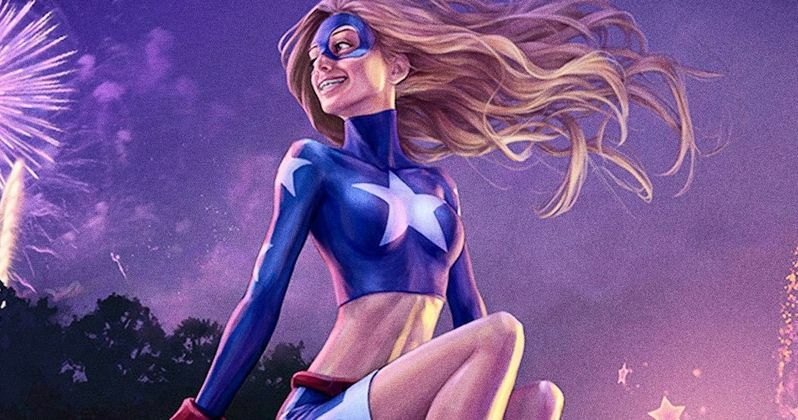 DC and Warner Bros. have given Stargirl a 13-episode first season order, with the series slated to debut sometime in 2019. In addition to announcing the show, DC also unveiled the first piece of art for the series, which showcases the titular hero looking all kinds of patriotic and, though not in the same comic book universe, like she could be Captain America's long lost little sister. You can check out the art for yourself below. This news comes to us courtesy of Deadline.